The state's largest commuter lot has become a popular target. Tire thieves hit the space a few times last year, which led to increased security measures. WASHINGTON — You’ve worked a full day and you’re almost home. You get to your car in the commuter lot, only to find your tires have been stolen. That’s the problem plaguing the Horner Road Commuter Lot in Woodbridge, Virginia, the state’s largest commuter lot with 2,300 spaces. It’s located right off I-95, which apparently is an attractive location for the tire thieves. On Thursday night, Prince William County Police said multiple vehicles were targeted; several motorists returned to the lot and found their cars on blocks. 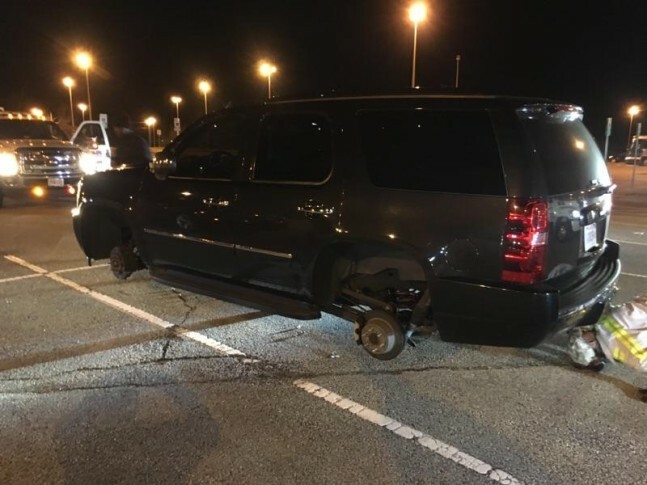 Tire thieves hit the commuter lot in May, September and October 2015. Police ramped up patrols and added temporary security cameras to the lot. Patrols are being stepped up once again, said Officer Nathan Probus, a Prince William County Police spokesman. He said police can only do so much, and that the idea of re-installing temporary cameras will be discussed. The Virginia Department of Transportation owns the lot. Virginia State Police officers patrol the area. There’s no word on whether the state police department will increase patrols.